Step 4: Include Socialize in your App! App developers can elect to use either the pre-defined user interface controls provided in the Socialize UI framework, or “roll their own” using direct SDK calls. All calls to the Socialize SDK are asynchronous, meaning that your application will not “block” while waiting for a response from the Socialize server. You are notified of the outcome of calls to the Socialize service via a SocializeServiceDelegate passed into each call to the Socialize SDK. The main class through which you will be interacting would be Socialize. If you are upgrading from a previous release, check out the Upgrading Guide. As of release 3.0.1, Socialize iOS SDK can be installed with CocoaPods. CocoaPods is an easy, elegant way to manage library dependencies in iOS. No need to manually import frameworks or deal with compiler flags. After a one-time installation of RubyGems (CocoaPods is Ruby-based), a single command-line operation is all that’s needed to install or upgrade Socialize. For more information on CocoaPods, check out the CocoaPods homepage. Current Macs come preinstalled with Ruby 1.8.7 or higher. For the purposes of CocoaPods, this is the correct version. However, you may still need to install RubyGems as directed from the installation page. Installing RubyGems and/or CocoaPods can take up to a minute, and may appear unresponsive for brief periods during install. 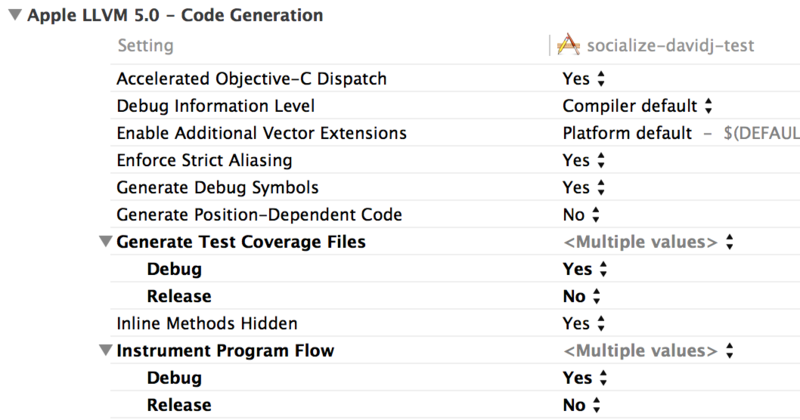 If you already use an Xcode workspace to manage your project files, you will need to customize your Podfile to include CocoaPods for each Xcode project and app target. If you are already using Pods also used by the Socialize SDK, you may need to ensure the versions are consistent. See this CocoaPods help page for more information. After the Socialize CocoaPod is created in your project, you must use the Xcode workspace (YourProject.xcworkspace) to use the CocoaPod. All your project settings should still be available to you from the workspace. DO NOT open the .xcodeproj directly. Once installation via CocoaPods is complete, go to “Configuring Socialize,” below. Some circumstances require Socialize source files to be altered before they are compiled. 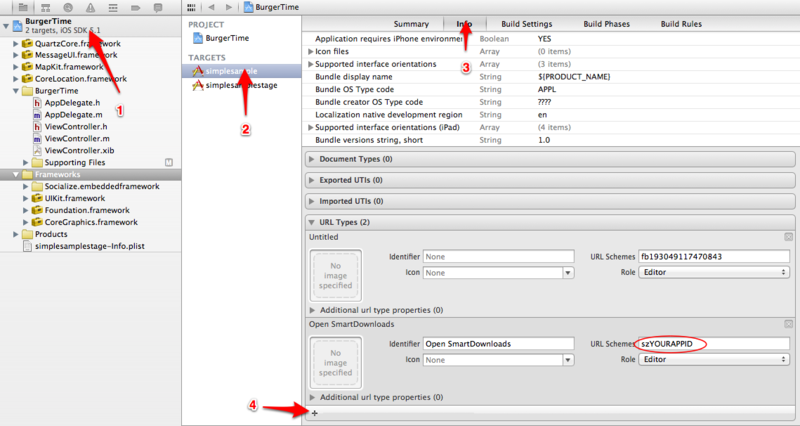 For those scenarios, you msut build the SDK from source instead of downloading it as specified in Step 1. Even though you are not using CocoaPods for your project, the Socialize SDK still uses it for some of its own dependencies. If you need to install CocoaPods, see the information above. Install the embedded static framework to your application. To do this just drag and drop Socialize.embeddedframework folder from the package to your framework section in your project. Be sure to drag the outlying .embeddedframework folder, not just the framework. The .embeddedframework directory contains both the Socialize framework and the Socialize resources. If you just add the framework, you will be missing important Socialize images and configuration files. 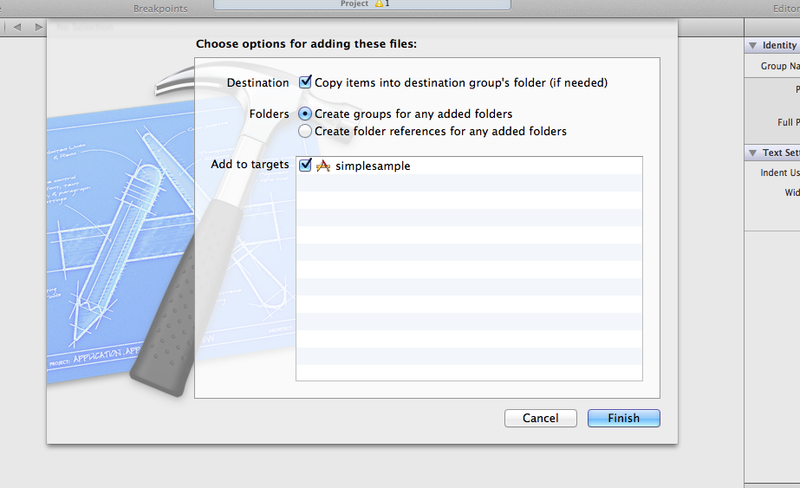 Be sure the ‘Create groups for any added folders’ radio button is selected during the above step. If you select ‘Create folder references for any added folders’, a blue folder reference will be added to the project and socialize will not be able to locate its resources. Add -ObjC and -all_load flag to the Other Linker Flags in the build settings of your application target. Please use the flag exactly as it is—the most common mistake here tends to be misspelling or incorrect capitalization. For older versions of Xcode (4.3 and below), if your app is not arc-enabled, you MUST also add -fobjc-arc to the Other Linker flags. If you need more detail configuring the SDK in your app please see our Getting Started Video. If you’re having problems please let us know by clicking on the ‘Feedback’ tab on the right side of the page. We’re here to help. Once installation is complete, go to “Configuring Socialize,” below. To utilize the iOS SDK and views into your app, you need to import the Socialize.h header and let the library know your app key and secret. Your application key and secret can be found at http://www.getsocialize.com/apps. Click your app and look for the ‘oAuth Keys’ module on the right-hand column. 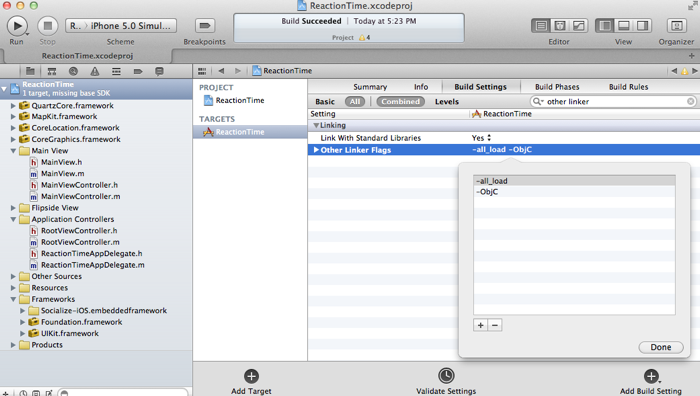 Defining an Entity Loader allows Socialize’s UI objects to link back to your application’s objects. The entity loader block is called from certain builtin Socialize UI Controls (e.g. Comment Details) when they need to show information about an entity. It is also used when directing users back into your app. Typically, you should have your own view controller for showing detail on an entity in your app. You should push a view controller onto the stack. If you’d just like to see notifications in action, you can use the bundled entity example entity loader called SampleEntityLoader. This class is not intended for use in a production app. In order to allow Socialize to direct web users back into your app, you should add a custom URL scheme to your apps settings. 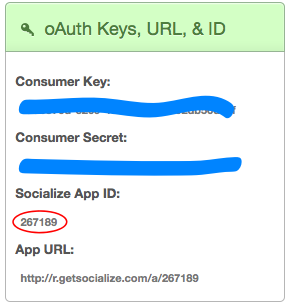 The URL Scheme is based on your Socialize app id, which can be found on the right side of your apps dashboard at http://getsocialize.com/apps/ under the heading “oAuth Keys, URL, & ID”. Now that you have your environment all setup, it’s time to include Socialize. This is a general purpose toolbar that sits at the bottom of your app and provides a central “one-stop-shop” of social features for your users. Remember if you want to use components individually please go see the SDK user guide. Each Action Bar instance in your app is bound to an Entity. An Entity is simply an item of content in your app. Each Socialize action (comment, share, like etc.) is associated with an Entity. An entity can be any item of content like a website, photo or person but MUST be given a unique key within your app. It is not necessary to explicitly create an Entity object when rendering the Action bar as this will be done for you, however entities can be created manually. Using the SocializeActionBar is very simple. Instantiate a SocializeActionBar controller and add the view to your view controller. For more info on configuring the action bar, see the Action Bar Section. Run the app in your simulator or device, have fun with the action bar, add comments, likes and shares. Then you can visit the app dashboard on the Socialize website to see new user actions show up in the analytics charts. You can also enable additional features like Push Notifications. © Copyright 2012-2014, Socialize Inc.